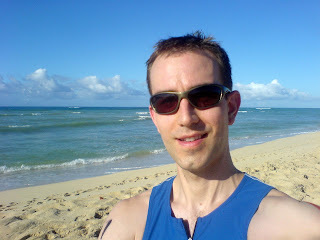 Last weekend I participated in the Fire Cracker Sprint Triathlon at Kaleoloa near my home on O'ahu. It was my first triathlon in 9 years, so I was a little apprehensive about it. With an official time of 1:22:49, I think did pretty well considering I hardly trained prior to the event and got hit by a car during the bike portion. It was a lot of fun, and I may start doing the multi-sport race more often from now on. The race consisted of a 500 m swim, a 20 km bike, and a 5 km run. I'm really cold-natured when it comes to swimming, so I was a little worried about the 6:00am start time. To my relief, the water temperature felt very comfortable for the 15 minutes I was in it. Swimming has never been my favorite activity, despite being on my hometown's swim team for two years when I was a kid. The freestyle stroke zaps my energy very quickly, so I always end up reverting to breast stroke when I swim, and this triathlon was no exception. With an official swim time of 15:11, I came in 117th place out of 154 finishers. That's not great, but at least I was faster than a quarter of the other swimmers. I wasn't very worried about the bike portion. After all, I have been cycling to school or work nearly every day for 23 years, so biking is second nature to me. Last time I competed in a triathlon I made the mistake of using my mountain bike. With their fat, cushy tires, mountain bikes just aren't made for speed on roads. This time, I opted to rent a road bike from a local bike shop. A scheduling mishap resulted in my not getting the bike until the night before the race. I only had time to ride it around my townhouse complex in the dark for about 20 minutes to familiarize myself with it. However, fate had a bigger problem in store for me during the bike portion of the race. Overall, I did okay during the bike race with an average speed of about 18 miles per hour and official time of 39:55. I hit my stride in the 2-mile home stretch with speeds in excess of 22 miles per hour with one major exception. For some reason a car was driving slowly about 15 miles per hour in the same lane as the race. Passing to the left wasn't an option, so I had to either slow down or pass on the right. Apparently, the silver Honda Element's driver wasn't paying attention to the spandex-clad cyclists sharing the road, so when I got close to his right rear bumper, he didn't give me extra room to pass. In the split second I had to react, I decided to go for it and attempted to pass on the narrow shoulder. It turned out to be the wrong choice because as soon as I got even with the car, it drifted slightly rightward and clipped me, sending me veering off out of control! The whole thing seemed to happen in slow motion, so I was able to land in such a way that I could roll away safely with minimal contact on the rough asphalt. In the span of 90 seconds, I fell down, tumbled, got up, brushed myself off, and was back on my way at top speed. Although I didn't lose a lot of time, about 14 competitors passed me, bringing my rank down to 113th place. 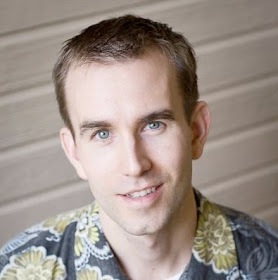 I have been a competitive runner for more than 15 years and regularly compete in races such as last year's XTERRA half marathon. My two most recent 5k race times from last year were 21:24 and 21:22, so I was very happy to finish the Fire Cracker Sprint Triathlon with a run time of 23:06 and rank of 42. That means I passed about 70 people during the running race - not too shabby if I say so myself. I wore my Garmin Forerunner 305 GPS watch during the entire race. It was my first time wearing it swimming. Since it's not rated for use in the water, I put it under my swim cap (like this) with only minor discomfort. You can view my GPS track in the Google Earth snapshots above and embedded widget below or click here for Garmin's nifty player. More photos from the event are posted in my phanfare album. After the adrenaline from the race had worn off, I realized that my wounds from the biking accident were more severe than I had thought. I have pretty major scrapes on two of my lower back's vertebrae, right elbow, right knee, right hip, and right hand knuckles. The back wounds are the worst. I have no regrets, though. Now I just need to work on becoming a more efficient swimmer and getting more road bike practice time. Does anyone want to sell me a good used road bike?